Jack Miller And Me: One And The Same? 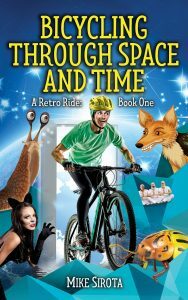 Bicycling Through Space and Time, the first book of my comedy/science fiction trilogy featuring cosmic bike rider Jack Miller, was initially not supposed to get published. I wrote the three books during the late 1980s-early ’90s with the idea of preserving my sanity during a challenging period of my life. I shall endeavor to explain. Yeah, that’s just about how I felt back then. I’d recently become single (read: divorced) and was totally out of shape physically. I’d acquired a bicycle—a clunky ten-speed Schwinn—and (reluctantly) started riding. The first time I sallied forth I managed a whopping five miles and almost died. Well, not quite, but I sure had a hell of a time finishing that ride. But I persevered, and three or four months later I was averaging 50-75 miles a ride, three or four times a week. Round trips from Oceanside to San Juan Capistrano; Oceanside to Mission Viejo; Oceanside to Laguna Beach. A couple of months after that I rode from Oceanside to Huntington Beach and back. That’s one hundred miles, folks, aka a century. By that time I felt like forty-something going on thirty-something. While riding along the Southern California coast was energizing, it also offered a lot of time to think. So, what does a writer think about? Stories, of course. And on one of those rides through the Camp Pendleton Marine Base I first met my alter-ego, Jack Miller. The longest and most challenging hill on the base takes you up to an area called Stuart Mesa. You climb it at the start of your ride, and back then I recall seeing many riders walking their bikes to the top. On the flip side, near the end of the ride you get to hurtle down it—exhilarating, though a bit terrifying. Among the most important things in a novelist’s toolbox are two simple words: WHAT IF. (See my post, “Throwback Thursday: What If?”) And one day, before, during, and after hurtling down the Stuart Mesa hill, a what if begat another what if, which begat another what if and so on. That’s usually how it works. 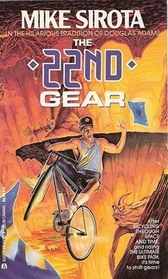 What if aliens implanted a 22nd gear on a 21-speed mountain bike? And what if shifting into that gear while racing down this hill at excessive speed transported the rider onto a cosmic tunnel called the Ultimate Bike Path? And what if gates or doors along this path allowed access to some of the strangest worlds imaginable? And so on. So I started fleshing out some of those crazy ideas, and the first thing I decided to do was to make it humorous. At that point I’d published over a dozen books—sword and sorcery, sword and planet, adventure fantasy, horror—and I didn’t feel like spilling any more blood. I needed some laughs, and this would be a cathartic way of entertaining myself. It would be an exercise, not a book proposal. To take it one step further, I decided that laughing at myself would be even more cathartic, and so, on one particular hurtle down the hill, Jack Miller was born. He lived in the San Diego area and loved bicycling—like me. He wrote fantasy and sword and planet novels with minimal success—like me. He had a prototypical Jewish mother in South Florida—like me. He was divorced and looking for love in all the wrong places—yeah, like me. But he couldn’t be exactly like me. I made him ten years younger—that’s called vanity—and I had him living on his lottery jackpot winnings—definitely not like me. He needed to be free of his wage slave job to ride the Ultimate Bike Path at any time. And so I became as crazy and stupid as I wanted to be, with six chapters of sheer lunacy, and let me tell you, I had a ball! Cathartic? You bet. I had created a daily fun escape from life in general, much needed at the time. Then, the practical part of me (a small part) kicked in, and I wondered if anyone would want to publish stuff like this. I thought about marketing the first six chapters but decided that, even if it were as funny as I thought it might be, much more of the same would make the narrative—and Jack—too one-dimensional. Did that help? Well, I sent the seven chapters under the title, Bicycling Through Space and Time, to Ace/Berkley, knowing that they did similar books. They immediately offered me a contract, my editor saying that chapter seven put it over the top. Needless to say, more “serious” chapters followed, not only in that book but also in its two sequels. 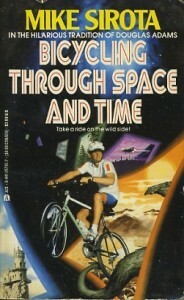 Bicycling Through Space and Time and its sequels had been out of print for many years—but no longer! I’ve just revised and released the first book under my Atoris Press imprint, and it is available in eBook and paperback from Amazon. 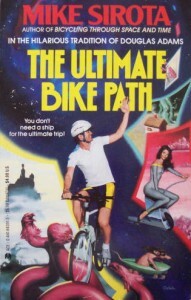 Book two, The Ultimate Bike Path, will be published in May. Look for the third book, The 22nd Gear, in July.